Working on the sales team, I am often asked what the benefits of our domes, particularly over a more traditional greenhouse. The unique geodesic design creates superior air distribution and airflow, which helps maintain a uniform temperature and keep it fungus and disease free. In addition, the 97% light transmission through the multifaceted glass ensures maximum solar gain, leading to an extended growing season. 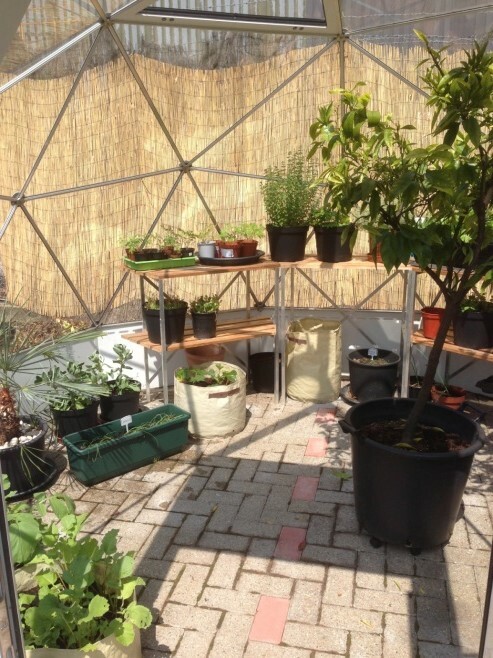 As a keen gardener I decided to experiment with growing a variety of crops in our on-site Solardome® POD office greenhouse and share with you the stories of producing crops for the office lunch table. The first task was to get the dome ready for the arrival of my new seedlings. During the winter our POD has been used to provide shelter for plants which are tender such as palm trees or small plants that need protection from the frost. This year’s spring has arrived particularly late but I started planting my seeds in April in the dome. In next post I will present a couple of plants that I planted during this time; I was amazed how quickly everything germinated.